Oh man, sorry for the long delay. After I made the general thing, I was thinking I could easily finish it within a week, but never got to it. But, here it is. I'm sure there's errors. Tell me if you see any, and I'll get to them asap. 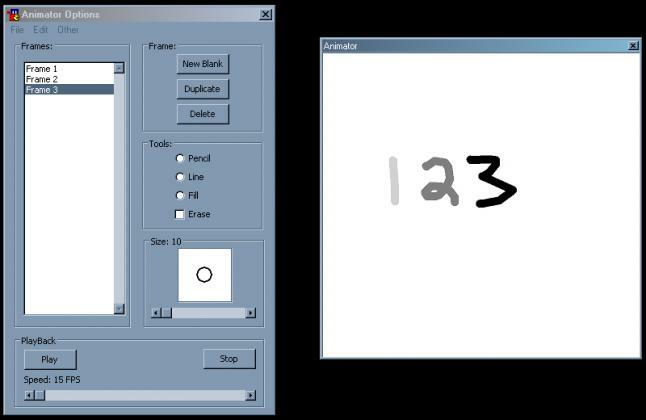 plus you shud be able to make it bigger :D animator thing :P drawpad woteva. i got the same problem as Neo_ i can save it. when i open it though each frame is black. Was wondering when we would see this. Very nice BlueThen. I'm a huge fan of unique releases and this definately qualifies. Im going to go ahead with a 9/10 as I'm positive you'll correct any errors that people happen to find. I got a couple of errors, but that's not why I'm commenting. I pressed "Play" many times in a row and the program sped up, and kept doing so until it crashed mIRC. That's weird, it should work fine. Try using it on a clean version of mirc. Darn! What version of mIRC do you have? Oh, forgot to explain the thing.... eh, I'm sure the pic and name explains itself.